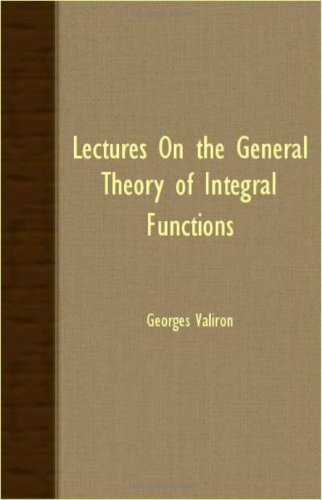 These lectures give us, in the form of a number of elegant and illuminating theorems, the latest word of mathematical science on the subject of Integral Functions. They descend to details, they take us into the workshop of the working mathematician, they explain to us the nature of his tools, and show us the way to use them. Contents: Maps between Riemann surfaces; Sheaves and analytic continuation; Algebraic functions; Holomorphic and harmonic forms; Cohomology of sheaves; Cohomology on a Riemann surface; Riemann-Roch; Serre duality; Maps to projective space; etc. The book on complex functions theory. From the table of contents: Introduction; The argument principle, and criteria of stability; Many-valued functions and Riemann surfaces; Conformal mappings and the Dirichlet problem; Index. This book presents a comprehensive, student-friendly introduction to Complex Analysis concepts. Its clear, concise writing style and numerous applications make the foundations of the subject matter easily accessible to students.